CNET's music.download.com: "...a collection of shining, harmonious, jangly pop songs...Clare's wisdom and craftmanship are apparent in his music". User review - CNET: "Someone really needs to 'discover' what many of us have known for years - that Clare really deserves to be heard. Indie labels of the world, wake up to what you have been missing out on." Rick Clare was a member of the first East Bay punk band the Street Punks. The former president of Reprise Records, Howie Klein wrote, "this hard rocking quartet packs the dynamic punch of true rockers like AC/DC or the early Stones, with a bona fide 1977 approach to the art". The Street Punks played throughout the San Francisco Bay Area and were a common attraction at San Francisco's infamous punk/new wave club, the Mabuhay Gardens. They also ventured to Los Angeles and played numerous clubs in the area, the most renowned was Hollywood's Whisky-A-Go-Go. The Street Punks were featured in local newspapers/magazines as well as national publications such as Rock Scene and Creem magazine. The Street Punks disbanded in 1978. A few months after the demise of the Street Punks (summer of 1978), Rick accepted a job with country singer Chinga Chavin, replacing guitarist and Bam Magazine founder, Dennis Erokan. Six months later Chavin packed up and moved to New York. In the early summer of 1979, Rick joined the hugely popular S.F. pop band, Times 5, where he would have his most success in the business. After Rick's tenure with Times 5, he immediately joined the Bay Area band, Fun Addicts, which lasted until 1983. Soon after the breakup of the Fun Addicts, Rick returned to college and during this time founded a band called Language Arts with former members of Times 5. After the breakup of Language Arts and while working as a Computer Programmer, Rick earned a Bachelor of Science degree from California State University. From 1979 to 1988, Rick operated a small recording studio out of his parent's house in Hayward. Among the bands Rick recorded were Times 5, Language Arts, Social Unrest, as well as demos for miscellaneous musicians such as Karl Leiker and Larry Carter of Romeo Void. Today, Rick works as a Software Test Developer for Virtual Instruments and lives in Danville, CA with his wife and two sons. After a lengthy musical hiatus, in 2003 Rick decided to re-tool his home studio and write and record new material. 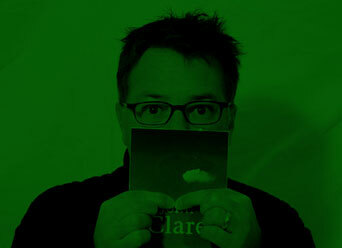 Hello Clare Fans! New tracks for my upcoming album are being recorded and posted via the Music link. Feel free to download the MP3s free of charge and please share. New tracks from my current project, Apollo, have been posted. Feel free to download the MP3s free of charge and please share. Thanks. Ok, I'm still alive and well and I'm not sure anyone is paying attention anymore, but I just posted a few new tracks for your listening pleasure. Tracking has begun on the latest Clare project, "Apollo". All completed tracks will be posted here so feel free to download and enjoy, free of charge. Tracking has begun on Clare's latest project which is currently titled, "Isolation". Many of the songs have already been written and will be recorded as time permits. As songs are completed they will be posted here for your listening pleasure (or displeasure). Tracking was finally completed on Clare's latest project, "Building Bridges" and mixing of the tracks is currently in progress. The latest Clare project, A Million Stairs To Hell, has been completed and is available for download. Tracking has begun on Clare's latest project - currently the working title is "Building Bridges". As tracks are completed, they will be posted here. On April 29, 2009 at approximately 1:30 pm I recieved devastating news of the passing of Clare session drummer and friend, James Perley. Forty six year old James was a loving husband and father, superb drummer, excellent attorney and loyal friend to many. He will be missed by all - rest in peace my friend. A memorial page has been created which consists of all Clare recordings where the drums were performed by James Perley - to view the page, click here. New tracks from Clare's latest project, A Million Stairs To Hell, are being posted to this site when completed, and keeping with the Radiohead tradition, feel free to pay what you want, or pay nothing at all. LOL. Mixing and mastering of Clare's latest project, "Today", has been completed and is now available for download, free of charge. All tracks were written, performed and engineered by Rick Clare with the exception of the bonus track version of Catching Trains where the drums were performed by Sir James Perley, Esq. Rough mixes of tracks from Clare's latest project, "Today", have been posted at the top of this page next to "featured_music". Tracking has begun on Clare's latest project, "Today". All songs should be completed and freely available for download some time in early 2008. LONG LIVE FREE MUSIC! Attention all Clare fans - Clare's latest project, Heart, is done and all tracks are available FREE of charge for personal use. Enjoy. Recording of, Heart, the current Clare project, has completed and mixing is currently in progress which should be finished by the end January 2007. Once completed, all tracks will be available to download for personal use FREE of charge. That's right, F-R-E-E, courtesy of Amigo Records, Ltd.
Members of Rick Clare's former band, Street Punks, have un-archived rare live footage of them performing at the Mabuhay Gardens some time in 1977. This particular show was memorable because it was a night the Street Punks co-billed the Fab Mab with S.F. punk band, The Avengers, and it was filmed by CBS News. To download and view the video, click here, or visit the Street Punks website.